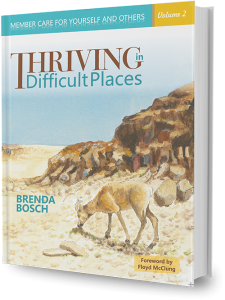 Chapter 1 from Thriving in Difficult Places – Volume 1 (E-book) is now FREE! Our previous offer of 320 free copies of Volume 1 have all been downloaded – we decided to extend the offer by giving away Chapter 1 to any registered site visitor (with no limit!). 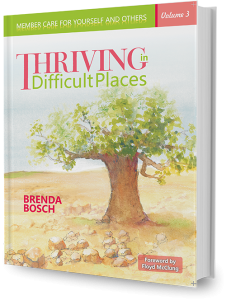 Add Thriving in Difficult Places – Volume 1 – Free Chapter (E-book) to your cart. The price is marked as Free. Proceed to Checkout. The system will ask for your Billing Address and Shipping Details, but will not ask you for any payment information. After Checkout, download from your “My Account” page and enjoy. 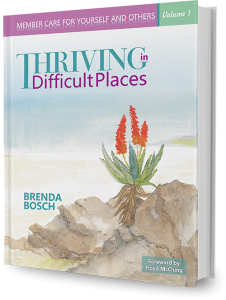 Thriving in Difficult Places: Member Care for Yourself and Others is more than a handbook or manual – it is rather a practical tool. You will probably not sit down and read the whole book at once. However, when you need a chapter or paragraph in order to help yourself or a missionary or aid worker, or to teach and train, it is readily available as a tool on and off the field. It is a self-help and “help others” tool to encourage, counsel, understand and train. The book is a practical tool for daily use. It is a missions handbook that will help missionaries (and even pastors) to look after themselves. It will also help Missionary Care Providers, leaders, trainers, churches, supporters, family and friends to understand the stressors and needs of missionaries, helping them to practically look after their missionary in order to thrive on the field and at home. Three volumes of 930 pages packed with practical ideas for missionary care! Written for the novice and non-professional —easy to use! Easy to navigate and find what you need now, without reading it all. This is for people of all nations and cultures. Available in PDF (for reading on computer) format. 24 PowerPoints (in PDF format) that correspond with every heading and bullet in the handbook are separately available for purchase. These contain colour, photos, graphs and charts. A sliding scale applies for the price of products, based on your honesty and integrity regarding your passport country at the billing address when you register as user. This will make products are more affordable for buyers from the Second and Third World. The applicable prices will only appear after registration. The author conducted a survey for missionaries in 2005-6 and more than 2,000 missionaries participated. You are welcome to download the outcomes free of charge in PDF format. This file and all other files connected to this website are not safe for workers in restricted access areas. If you would like safer files, please contact the Author via info@thrivingmember.com. author of “Father Heart of God” and various other books. – Leah Albano, Director of Discipleship Training School, YWAM Antipolo, Philippines.